Learn how to cook or perfect your technique in a fun, intimate class with professional chefs and equipment. We have partnered with local caterers, bakers, and chefs to create an experience that cannot be beat! Browse our class offerings and reserve your spot below. Please note: classes are non-refundable and non-transferrable. For more information about our instructors and class policies, select from the links to the right. Learn the proper way to poach, fry, boil, bake eggs and make the perfect omelet. Includes eggs Benedict, huevos rancheros and baked eggs in ham nests. Let’s escape to the tropics for an hour with these fun, island-inspired drinks! This 1-hour class will focus on creating the quintessential tiki drinks; we will discuss the history of the Tiki culture, talk about the best liquors to use, and make everything from scratch. Participants will learn to make (and then enjoy!) a Painkiller and a Mr. Bali Hai tiki drinks. Join us for a culinary trip to France with this meal inspired by springtime in Paris! The menu will include Roasted Salmon, Fricassee of Spring Vegetables (Asparagus, Peas, Leeks, Shiitakes), Chervil Veloute, and will finish with Chocolate Pot de Crème - ooh la la! Everything in one pot (er, I mean pan.) Learn out easy and tasty they can be - especially when fresh herbs and a tasty sauce are added. 3 Sheet pan dinners to dine on and lots of ideas to take home! Looking for new ways to prepare chicken? In this class, different methods (including roast, sear and braise) will be demonstrated, as well as tips on how to enhance and change up flavors. We’ll talk about difference between parts (like thigh and breast) as well as boneless and bone-in. Dine on chicken prepared 3 ways with sauces and sides that make you go YUM! Experience the South in your mouth with this tasty series! Begin with an appetizer of pimento cheese snd a summer salad course with spinach, tomatoes, corn and fennel with olive oil and balsamic vinegar. Plus an offering of Old Forrester bourbon to get the class started off right! Dinner will feature a couple of Mississippi staples: Collard Greens, and Hot Tamale Pie, made with pulled pork, cornmeal, masa, green chilies, red chili sauce, cheddar cheese, tomatoes, green onions, & Y’all Sauce Co Mississippi Comeback Sauce. An unparalleled fritter, falafel is simple in its composition and complex in its flavor. Learn to make it from scratch along with the art of grilling an eggplant and mashing it up for the delightful Babaganoush. Enjoy this wholesome meal with tahini sauce, pita bread and fattoush salad. Sample 10 different beers in this fun class that will teach you the basics of craft beers! You will learn what makes a "craft beer" a craft beer, why they are more delicious, and different styles and tasting profiles. Come thirsty! Join us for this 1-hour class to learn how food and wine truly compliment one another. Participants will enjoy 5 different wine varietals & sample small bites that accompany each. Holy guacamole! Now here’s a menu you would not want to miss. Tortilla cups with guacamole and seared shrimp; Tex-mex egg rolls with jalapeño-cilantro crema, blackened fish tacos with sriracha aioli; Southwest salad, salsa verde and pico de gallo of course! Finish with divine churro-cheesecake. Come hungry! Bring a big appetite for a classic Italian dinner including a simple salad, Risotto Milanese with seared shrimp & sautéed Swiss Chard, followed by Tiramisu. Delizioso! Learn and practice proper knife techniques in this popular hands-on class. Each participant will receive a FREE CHEF’S KNIFE (valued at $69.95) in addition to a full meal, so come hungry! A gourmet brunch that's the perfect early Mother's Day treat! Vegetable quiche, Lemon Blueberry Muffins, Apple Pie bars and Crostini + Lox all topped off with a strong cuppa jo - is there a better way to start your Saturday? In the spirit of Downton Abbey, enjoy a special afternoon honoring mothers at this English High Tea. This decadent menu will include traditional tea sandwiches, assorted pastries, scones with jam and clotted cream, English Tea with cream, and rose-flavored lemonade. Impress your guests at your next dinner party with this delicious menu featuring French techniques with a Southern spin. The menu will include Pancetta Wrapped Pork Tenderloin, Parmesan Polenta, Spicy Broccoli Rabe, and will finishe with Vanilla Crème Brulee. 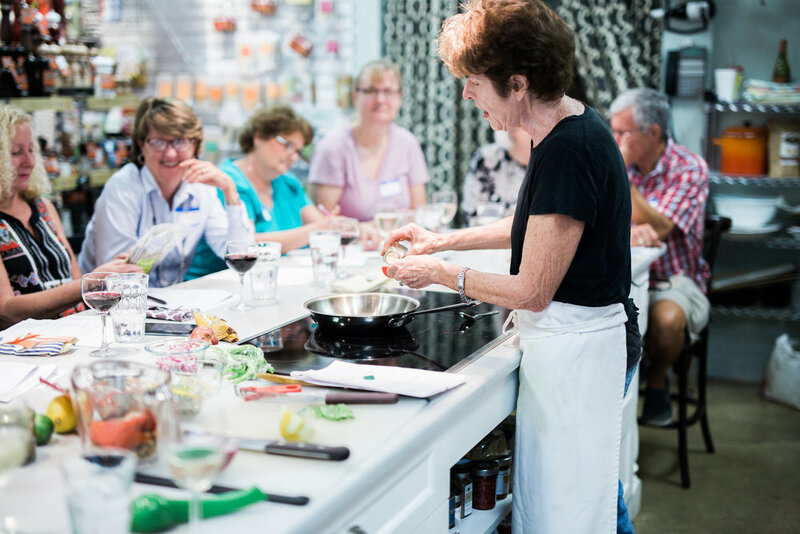 Learn from the master of Italian food himself in this class that focuses on rustic Italian favorites, including caponata & tortellini, chicken & roasted vegetable manicotti with a wicked rich parmesan cream sauce, and a homemade pasta with puttanesca sauce. Arabian, Mediterranean and Berber flavors combine to become this zesty, spicy, flavorful cuisine. Moroccan food liberally uses chili with their signature harissa sauce. Learn to make it and enjoy a meal fit for the Sheikh. A fish stew with spiced rice, and lamb chops, who doesn’t like lamb chops. Add chick peas and roasted eggplant mash into the mix and it’s a feast. Finish with buttery semolina pancakes topped with honey. Experience the South in your mouth with this tasty series! Begin with an appetizer of pimento cheese with toasted bread and boiled peanuts, plus an offering of Old Forrester bourbon to get the class started off right! Fried chicken is synonymous with the South, and tonight we’re making grandma proud with sides of homemade biscuits and mac ‘n cheese. Since I grew up in Knoxville, TN, this was always on the table for Sunday Supper or going to my Granny’s house for a special occasion. Crispy fried chicken, biscuits, and mac and cheese with a side of Y’all Sauce Co Tennessee Jezebel Sauce ...can’t go wrong with that! Margaritas may be your go-to beverage when you are enjoying a meal of tacos, but did you know that wine pairs just as well? Lets Taco bout it over wine! Want to make delicious cocktails at home? This 1-hour class will focus on creating champagne cocktails - super easy, super delicious, and perfect to serve at any holiday occasion! Participants will enjoy 3 cocktails plus some light snacks. Blooming Champagne Cocktail, Easy Splash Champagne Cocktail, Caramel Apple Mimosa (Champagne, Vodka). Tonight's menu will feature a Spanish-inspired, quick and easy pork stew, plus guests will learn "untraditional" techniques for risotto and polenta that are largely hands-free. Take control of your fish and learn how to poach, roast, sear and braise! This demo covers the basics of each technique plus tips on buying, storing, prepping and choosing complementary sauces. Dine on seafood prepared 3 ways. Leave with new recipes and seafood confidence. Pizza making is fun and a great way to get guests involved in making dinner! Join us for this hands-on class where you will learn to make your own dough, sauce, and a variety of pizzas! This class is a perennial favorite. Come walk the streets of Havana with us as we take this culinary tour, drinking mojito and listening to salsa. Learn the Spanish names of the dishes you sample and prepare to be amazed. Dine on Crunchy fried plantains topped with fresh pico, potato balls stuffed with spicy meat, picadillo meat pastries, mojo fish over pineapple slaw, melt in your mouth arepas, and the hangover remedy sandwich. Then bite into the divine guava-cream cheese pastry and you will discover what the fuss is all about! Eggs with tomato sauce and cheese. Delicious and pretty, it’s also easy and perfect for breakfast or brunch. Add a salad and crusty bread to make a very satisfying dinner. Did you know you that you can use your cast iron skillet on the grill as well? In this class we will be cooking a range of recipes that are suitable for your grill. We’ll start with a cheesy jalapeño skillet dip with chips and veggies. We’ll then do a cast iron broccolini with butter beans. This will be followed by the entree, a balsamic marinated stuffed flank steak. And we’ll end the meal with a grilled peach cobbler. This will be a class focused on the national Spanish dish and some great sides. We’ll start with a traditional vegetable gazpacho followed by a tapa of asparagus, mozzarella and prosciutto parcels. The main dish of course will be a traditional paella with seafood and chorizo sausage. And we will end the meal with a Spanish flan dessert. Want to make delicious cocktails at home? Learn how to craft the perfect Margarita and Salted Caramel Martini from scratch (no mixers!). We will be sampling a variety of ingredients to compare the difference between Cointreau and triple sec, and enjoying our two cocktails. Light snacks will accompany the cocktails, but please eat before class! Explore the abundant flavors of Asian food the fun way by serving it on small plates and making it a tasting menu. Learn to make some popular Asian favorites and enjoy them with a variety of sauces and dips. The menu will include Tom yum goong soup, pork & chive dumplings, Singapore street noodles with shrimp & peanut sauce, Korean bibimbap, shrimp pancakes with cilantro sweet chili sauce, and banana fritters with caramel. Treat yourself to dessert - dessert cockails, that is! In this class, participants will start with a Chocolate Grasshopper Martini and then be given dessert cocktail options to create your own delicious concoction! Learn how to roast a whole fillet of salmon. Recipes include roast salmon with fennel, red bell peppers and onion; enjoy a side of creamed potatoes and finish off this lovely meal with strawberries and cream. Learn and practice proper knife techniques in this popular hands-onclass. Each participant will receive a FREE CHEF’S KNIFE (valued at $69.95) in addition to a full meal, so come hungry! This is a vegetarian food lovers’ paradise. We will start our vegetarian feast with a Lentil soup and falafel. We will then taste the Lebanese version of spanakopita, Turkish eggplant parm, Syrian pilaf, and stuffed peppers. Finally we will end with vermicelli & cheese pancakes doused with lemony rose syrup. Come one, come all and join us as we learn how to bake and roll Chewy Chocolate Chip, Cinnamon Snickerdoodles, and cut out Sugar Cookies! The Simple Goodness of Sicilian pasta: Learn how a few simple ingredients can create quick pasta dishes bursting with flavor: pasta alla norma, with sautéed eggplant, garlic and tomatoes; pasta with pistachios, tomatoes and mint. Pasta with pine nuts and raisins. Celebrate the start of summer with an Italian-style picnic! Begin your meal with Sicilian Caponata and a chilled tortellini salad, then feast on a cast iron skillet hanger steak with shallot marmalade & Parmesan fonduta. Finally, end your evening with Nonna's Vanilla Pudding and "PTA" cookie bars. Discover how easy it is to make homemade buttery flakey pie crust. Working in teams of 2, participants will make it, roll it and blind bake it then dine on the yummy creations including quiche, galette and pie! Who says you cant have your dessert and drink it too? Trust me, if you choose the right wine, your ice cream will taste even better. Join me for this fun summer course to learn how! Beam me to the South of France Scottie and dine on simple salad with champagne vinaigrette, herby roasted chicken thighs and vegetable tian. Oh! and finish with classic French Tarte Tatin. Bon Appetit Y’all! What father would not enjoy these tasty dishes? We’ll start the meal with a tasty Caesar salad with homemade croutons. This will be followed with beer macaroni and cheese (this is amazing!). The main course will be cast iron pan seared pork chops with white wine, butter, lemon, and garlic. The dessert will be chocolate mocha brownies with ice cream. You'll be ready to enjoy a summer picnic after learning how to make: Vegetarian Shooter Sandwiches, Black Eyed Pea Salad (with Chow Chow) and Pecan Sandies. Make ahead, easy to pack and carry - on a bike or a hike! Celebrate the best part of cookout season: the sides. Our lunchtime side item journey includes greek pasta salad with homemade vinaigrette, fresh dill potato cucumber salad, and spicy fruit salad. You’ll learn new delicious recipes, preparation and transportation considerations for making dishes meant for travel, and leave with a full belly. This delicious class will show you how to make the most of your cast iron. We will start out with a brown butter cornbread followed by a farmers market vegetable ratatouille. The main course will be pan seared salmon with a dill sauce and sautéed asparagus. This will be then followed with a grandmother’s apple cake. This is some yummy food! Not for vegetarians only! This demo class will be crammed with info for creating delicious, nutritious plant based sides and main dishes. Your friends and family with be asking for More veggies, grains and beans Please! The spiralizer makes beautiful and delicious vegetables. See how easy it is and enjoy lunch including salad and Zoodles (gluten free really good pasta substitute!) with Basic Tomato Sauce. Come experience the subtle, and exotic flavors of Persia. The richness of Saffron infused into the mellow shrimp served over sautéed leeks, fish steamed with a tamarind-cranberry-walnut stuffing, basmati pilaf with orange zest, pistachios, almonds, apricots, and walnuts paired with herby meatballs tossed in pomegranate molasses. This meal will ignite your tastebuds and leave you asking for more! Learn the keys to this Southern mainstay from contemporary to classic, as we talk about all the variations with ham, cheese, and more. Recipes for the class will include Vidalia onion dip, shrimp and grits, and an avocado salad. ASIAN TAPAS: FEATURING A NEW MENU! Let’s tour Southeast Asia and explore the coco-nutty flavors of Malaysia, Thailand Vietnam and the Philippines on small plates. Start with the half cold-half warm salad doused in peanut dressing, the creamy yet tangy soup, Penang curry smothered rice noodles, chicken satay from the streets of Bangkok, fresh rice paper rolls stuffed with crunchy veggies and shrimp, and finally a taste of heaven: sticky coconut rice served alongside ripe sweet mango. What better way to sample the best of the Far East. If you love baking, you are in for a treat! In this class, Laurel will teach you the secrets behind creating beautiful cookies that look as good as they taste! Participants will get the recipe for the icing, and everyone will get lots of guided hands-on practice using various techniques to decorate. From coast to fields to mountains, Indian cuisine varies with its terrain. Enjoy the familiar tandoori chicken and naan bread, as we introduce you to the spicy coconut fish curry from the malabar coast, the minced shrimp patty from Mumbai, lamb cooked in spinach from central India, and pan seared shrimp with a squeeze of lime.....yum-yum. This culinary experience will open doors to the world of complex Indian food and flavors. Experience the South in your mouth with this tasty series! Begin with an appetizer of pimento cheese with toasted bread and boiled peanuts, plus an offering of Old Forrester bourbon to get the class started off right! Growing up in Knoxville, TN, my mom made pan-fried pork chops all the time using a cast iron skillet. I will always remember the smell of this deliciousness walking into the house, and tonight we’re enjoying it with okra & tomatoes and a side of Y’all Sauce Co Tennessee Jezebel Sauce. This class will focus on the bounty of the sea particularly the North Atlantic Sea! We’ll start with a delicious New England clam chowder, the kind I grew up making and eating all my life in Maine! This will be followed by an appetizer of spicy grilled shrimp, shrimp fra diavolo. The main course will be grilled swordfish with a mango salsa. And we’ll finish the meal with a blueberry cobbler with a cornmeal sugar-cookie crust. You are in for a real treat! The barbeque man himself will be presenting an evening full of his favorite Spice Rubs & BBQ Sauces, Award-Winning Pork Rib Cooking, Beef Brisket "Burnt Ends", and an incredible dessert of Pit Master S'mores. Small plates, abundant variety and lots of wine - that’s the Spanish way of life. Come experience a different dining style and learn to make entertaining a piece of cake with these simple and easy recipes. We will enjoy spinach & garbanzo salad, patatas bravas with aioli, meatballs with romesco sauce, garlic shrimp, pinchos with a variety of toppings and much more. Come hungry! Are you ready for some more cast iron cooking delights??? We’ll start with a jalapeño corn bread. This will be followed by cast iron stir fried vegetables. The main course will be a delicious honey roasted chicken breast dish. And the dessert will be a raspberry cobbler. Good stuff right there!!! Learn how easy it is to make homemade pasta - and how delicious it can be. I’ll demonstrate the process and class participants can cut it (with a hand crank machine) and or assemble ravioli. Dine on homemade fettuccini with mushroom sauce, cheese ravioli and vegetable lasagna. Definitely for pasta lovers only! Vindaloo, tikka masala, tandoori, chick peas, creamed spinach and cottage cheese.... this is the dinner you don’t want to miss. Don’t just enjoy these dishes at your favorite restaurant, come learn how to make them and become the masala chef of your kitchen. Papadums, chutneys, naan bread, basmati pilaf, raita and almond pudding; this menu comes with all the bells and whistles. Lunch and Learn: Carrot Soup & Open Face Cheese & Tomato Sandwich: Creamy carrot soup with a hint of miso served with a cheesy tomato sandwich. Comfort food that’s great for brunch, lunch or easy dinner especially when the summer crop of tomatoes appears! Master classic Southern pimento cheese, and use it to make pimento-cheese stuffed burgers and mac ’n’ cheese, served with a side salad. Come bake and decorate the cutest spring cake that's sure to be the centerpiece of this year's Easter table! We'll be baking buttery vanilla poundcake layered with luscious homemade lemon curd and frosting it buttercream florals. Guaranteed to impress your guests! It’s a feast in the Middle East and you are invited. Come enjoy the flavors of Arabia with mezze platters, dips, salads, the classic chicken shawarma, kebabs, salads and pilaf. Finish with Umm Ali, an Egyptian- melt in your mouth dessert. Learn to make all the dishes you crave and amaze your family and friends. Do you clam up at the thought of preparing your own shellfish? Learn how to be a shellfish pro in this class! Shellfish includes 2 groups: crustaceans (like shrimp and crab) and mollusks (like clams and oysters). Examples of each will be prepared in class using various techniques, followed by a shellfish dinner including Pasta with Clams, seared Diver Scallops and more. Test drive recipes from Le Creuset’s cookbook, The Cast Iron Way to Cook, in this class, and then take the book home for FREE! Learn how to make cornbread with cinnamon honey butter, Bouillabaisse with mussels, fish, fennel, potatoes & tomatoes, wild mushroom risotto, and chocolate & raspberry cake for dessert. Find out how homemade pasta is different from store-bought...and why it’s worth it. Pasta dough is easy to make and pretty forgiving. I’ll demonstrate the process and class participants will have an opportunity to cut pasta (with a hand crank machine) and/or assemble ravioli. Dine on homemade fettuccini with mushroom sauce, lemon ricotta ravioli topped with brown butter sauce and vegetable lasagna - for Pasta Lovers Only! Yes, we have all dismissed English food calling it plain, bland, and nothing to fuss about, and fish & chips is all that comes to mind. But there are some simple yet delicious items that our friends across the pond call comfort food...and it’s time to sample the best of the best! Tonight’s menu includes Shepherds pie, Welsh meatballs with onion gravy & mash, Welsh rarebit, scotch eggs, beef and stout stew, and bread & butter pudding. Enjoy a 2-hour lunch that highlights the deliciousness of Cuba; be transported to Havana to experience the sabores (flavors) of their sofritos (sauces), the orange mojo marinades, and enchilados (stews)! The menu includes Black bean soup, Cuban lechon asado (roasted pork), shrimp enchilados over saffron rice, empanadas with cilantro crema, and mojo grilled fish over pineapple slaw. We will end with the creamy and rich tres leche (3 milk) cake. Join us for a delicious and inspiring evening hosted by Jeff Bacon, lead chef at Providence Restaurant, and his co-workers! Providence Restaurant is a branch of the Second Harvest Food Bank that provides an up-to 2 year residency program for chefs who have graduated from the Triad Community Kitchen Culinary Training Program. Tonight, we will be on a culinary tour of the South: see and taste the latest and the hottest culinary craze in the land. From Miami to Richmond, learn what the south’s top chefs are bringing to the restaurant tables in the new south. Learn how to make the best seafood dishes for dinner in less than 30 minutes. The menu will include NC Flounder en papillote with Mediterranean spices and NC red snapper with sweet coleslaw. Learn & practice proper knife techniques in this hands-on class. Each participant will receive a FREE CHEF’S KNIFE (valued at $69.95) in addition to a full meal, so come hungry! This class focuses on ways to eat as many home-cooked meals as possible, including what, where and how to stock foods for the upcoming week. Class will include preparation and storage of vegetables, proteins and condiments, as well as ways to combine them for fast delicious meals. Dine on several menu combinations using ingredients prepped in class, and leave with recipes and additional menu suggestions. Learn how to make dishes inspired by a James Beard Award winning restaurant using fresh ingredients & rustic Italian preparation. The menu includes classic seafood po’boy with Italian mostarda, crispy fried NC oysters with tarragon yogurt, and Bucatini pasta with NC littleneck clams & hot Italian sausage. Let's prep for all of those April showers coming up! Whether for a wedding, baby, etc, we'll be making bite-sized brownie hearts, floral cupcakes, and cheesecake cups perfect for any event you'll be hosting this spring. Learn how to appreciate and pair cheese with beer in this fun, 1-hour class that will feature a diverse range of cheeses and craft beer. No more bottled salad dressings! This “how to” class features 3 homemade versions, including Caesar’s, poppyseed and Green Goddess. Dine on yummy salads that pair each dressing with complementary greens and ingredients -a bountiful Salad Bar! Homemade Italian food is unquestionably some of the best there is; in this class, learn how to make delicious Italian meals from scratch. The menu will include a Homemade Pasta & Ravioli Demonstration, Puttanesca Sauce, and Pork Cutlets with Three Sauces: Milanese, Marsala, & Parmesan Cream.